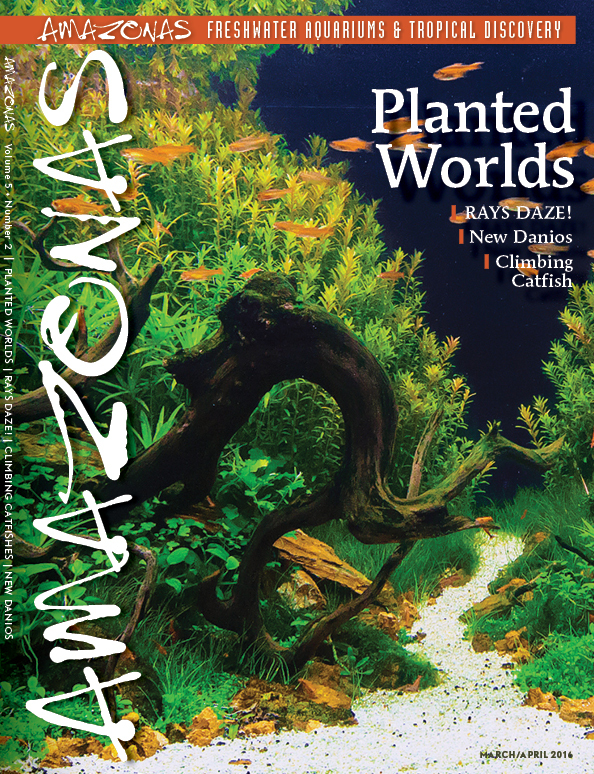 AMAZONAS Planned Cover 5-2: Planted Worlds with a Portfolio of award-winning aquascapes from the AGA 2015 Competition. Perennially the highest-ranking article of the publishing year in AMAZONAS, the March/April 2016 Issue will feature an awe-inspiring portfolio of the world’s winning freshwater aquarium aquascapes. The very best of more than 500 entries in the Aquatic Gardeners’ Association Annual Competition, the winning tanks range in scale from tiny to expansive, but some of the most impressive, say the judges, were rich scenes created in smaller systems, such as this 35-gallon (132-L) creation by Chaiya Choowa of Bangkok entitled, Autumn River. The ad deadline is fast approaching. • RAYS DAZE — Explore the streams of South America with Hans-Georg Evers, Jennifer Reynolds and Michael Tuccnardi in search of freshwater stingrays that beguile all underwater naturalists and that can make amazing aquarium specimens for dedicated hobbyists with larger systems. • NEW DANIOS — Professor Ralf Britz catalogues an amazing procession of Danio species coming out of Myanmar as restoration of the Burmese aquatics trade has opened the gates to fishes that have all the beauty and hardiness needed to become important players in the aquarium trade in coming years. • CLIMBING CATFISH — Martin Grimm tracks down the amazing Stargazer Mountain Catfish in streams near Africa’s Mt. Kilimanjaro and finds Amphilius, a genus of small, fascinating animals from Tansania that can climb waterfalls and delight the adventuresome home aquarist. Much more: Breeding Channa sp. “Cobalt Blue,” collecting the impressive wild Corydoras geoffroy, and encountering Retroculus acherontos a stunning new current-loving cichlid from the Rio Tocantins basin of Brazil that has the cichlid world abuzz. LAST CALL to reserve space.